Your barbecue isn't just for burgers! Cook up a quick and easy appetizer by following our Grilled Parmesan Bread recipe and get the party started. Heat barbecue to low heat. Separate dough into 8 triangles. Brush both sides of each with dressing; sprinkle with cheese. Place sheet of greased foil on barbecue grate; top with dough triangles. Grill 2 min. on each side or until bread is done and lightly browned on both sides. 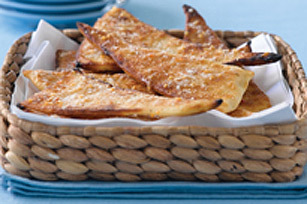 For quick-and-easy appetizers, top warm bread triangles with your favourite savoury toppings.